Prior to the Second World War, Godley Head was a lonely place but never completely devoid of people. Apart from the lighthouse keeper and fitful attempts at farming, the Head attracted a continuous stream of day trippers and picknickers. Once war came the Head’s population became both permanent and extensive. The camp accommodated gunners, Naval personnel, WAACs (Womans Auxiliary Army Corps), and Home Guard. Families grew up here and a strong sense of community was developed. Many who did part or all of their war service on the Head still fondly remember its camaraderie. Romances and even marriages resulted from the close relationships of such an establishment. The recreation room became the heart of the community and its daily gathering place. 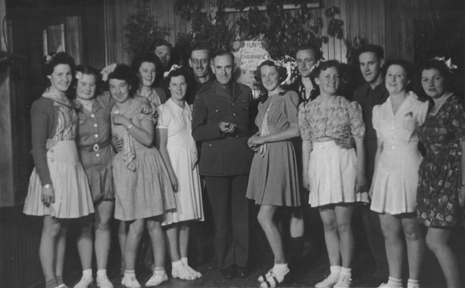 Dances, concerts and films were regularly held to entertain the troops and maintain their morale. The Army gave active support to sports and a number of teams from Godley Head participate in local competitions. All remember the food supplied at Godley Head was good and plentiful, which was certainly not true of all wartime camps. There was no wet canteen but the camp was by no means dry. Those in need of substantial refreshments usually managed to find their way (unofficially) to the hotels of Sumner. Regular leave was allowed and transport to and from Sumner was provided. However, missing the last tram from Christchurch to Sumner meant missing the leave truck and an expensive taxi ride to the Head. On one occasion, a group of well oiled soldiers returned one night in a taxi accompanied by a large billy goat, late of Sumner. The Sumner constable expressed his disquiet, the culprits were found, the billy goat returned, and no action was taken by the police, knowing full well that the army would deal with its own in it’s own special way. However, not all events had a happy ending. Four men died while stationed at Godley Head, but none at the hands of the enemy. During the fighting of one of the regular grass fires at Godley Head, Gunner W.D Burke accidentally fell over a cliff edge to his death. During the changing of the morning guard at the Godley Battery, a member of the old guard accidentally discharged a rifle, seriously wounding one man and fatally wounding Gunner N.J Lush. Lush was rushed to hospital in Christchurch, where he died a couple of days after the shooting. The Army managed to bring his parents up from Dunedin to see him before he died. The leave truck returning at night from Sumner failed to take the final bend before the camp and rolled down the hill, strewing men and equipment over the slope. Gunner E.R.T Robinson died at the site and Gunner L.J Williamson shortly after in hospital.